Should We Give Our Jobs to Robots? If you use the self-service checkout machines at grocery stores, you have effectively voted to give jobs to robots rather than people. We’ve been slowly passing our livelihoods to machines for decades. Guys used to pump our gas. Computers used to be women working at desks doing calculations. We poke ATM machines rather than chat with bank tellers. Taxes were prepared by accountants and bookkeepers, not programs. We bought music and books from clerks in stores. We used to have repairmen heal our gadgets, now we toss them as soon as they break, and just buy cheaper replacements. We purchase the mass produced rather than the hand-crafted. Our factories used to employ millions, but capital moves manufacturing anywhere in the world where labor is cheapest. Their next step is to automate those factories and get rid of the cheapest workers. Even the fast food worker, the starter job for kids and the fallback for the unemployed, are about to be taken over by robots. Robots have begun to do the work of professionals, like lawyers and doctors, and they are getting smarter every day. Most of us ignore all these trends because we focus on our personal lives. 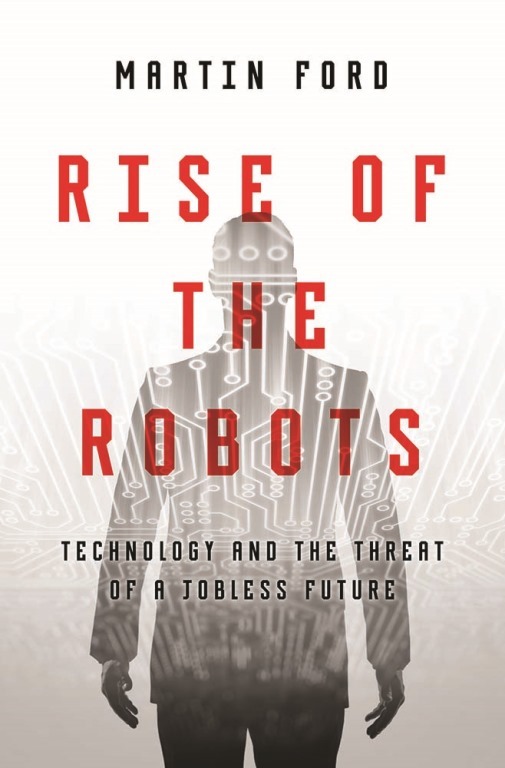 It would be wise if you are planning your career, or living off retirement savings, to read Rise of the Robots: Technology and the Threat of a Jobless Future by Martin Ford. Automation is a disruptive technology that will impact jobs and savings. The book careful details what’s been happening in the past, and warns of what will happen in the near future. Every day we decide to hire robots through our purchases. Every day we choose robots over people when we buy the cheapest products. Every day we side with capital over workers when we attack unions. Real wages have been dropping since the 1970s. Average household income has only keep par with falling middle-class earnings by having two incomes. Many individuals work two jobs to keep up. The biggest employment sector is the service economy, which generally pays close to the minimum wage. There are two movements to watch. One, to raise the minimum wage to $15 an hour, which benefits labor. The other, is to create robots to do those jobs, that benefits capital. Who will get those jobs in the future: humans or robots? If capital gets its way, it will be machines because you want the cheapest hamburger and fries you can get. Even though most people in the U.S. are labor, the vast majority sides with capital. For centuries there’s been two forces at play where humans make their living: labor and capital. To understand this read Capital in the Twenty-First Century by Thomas Piketty, a very readable history. Anyone who wants to understand money and savings should read this book. There’s always been a balance between workers and investors. Investors can’t create industries without labor, so labor had a leverage in getting a fair share of the wealth. That leverage has weakened since automation. Capital is about to eliminate most labor costs by buying robots. And we’re letting them. Almost all wealth comes from consumers, and that’s a kind of voting block. We accept automation and robots buy buying goods and services made by machines. We do this because we want everything on the cheap. To understand where our natural drive for cheapness is leading us, read Cheap: The High Cost of Discount Culture by Ellen Ruppel Shell. We’ve been voting to eliminate people from their jobs since the development of the self-service grocery store. Like climate change, overpopulation, mass extinction, wealth inequality and all the other major problems we face, we are the cause, and have chosen our path even though we refuse to look where we’re going. We are giving our jobs to C-3PO. It’s a decision we’re making, although most people don’t know it. To better understand what I’m saying, read these three books. All are easy to read, and entertaining in their presentation of history and facts. We need to stop wasting so much time in escapist entertainment and look around to what’s coming. I’m a lifelong science fiction, and was a computer programmer. I love robots and artificial intelligence. I want us to invent far-out robots that do things humans can’t do, but I don’t want robots taking jobs that humans can do, and need to do. Civilization is breaking down in countries around the world where young people have no jobs and few prospects. It’s the cause of terrorism. A stable society needs to have most people working, even at jobs a machine could do. Next Next post: How Old Do You Need To Be To Avoid Climate Change Disasters?